This quaint North Carolina town was Andy Griffith’s childhood home and the inspiration for Mayberry in the beloved 1960s sitcom The Andy Griffith Show. Everyone says you have to visit the real-life Mayberry in Mount Airy. But being a “must see” doesn’t mean it can’t surprise you. Learn more about this classically North Carolina destination, and then go beyond the guidebook with our insider tips. It’s Andy Griffith’s childhood home and the inspiration for Mayberry in the beloved 1960s sitcom The Andy Griffith Show. Located 40 minutes northwest of Winston-Salem, Mount Airy has embraced its role with a number of attractions that honor its native son and his show. The Mount Airy Visitors Center offers free maps for those who’d like to explore by foot. Take a Squad Car Tour in a replica of Deputy Barney Fife’s or Sheriff Andy’s car. Leaving from Wally’s Service Station, up to five people can climb in and cruise the sights for 30 to 45 minutes. A replica of the jail and courthouse is next door. Overnight accommodations also are available at the Mayberry Motor Inn, where guests can request the Aunt Bee room, furnished with items once owned by the late actress, Frances Bavier, who played beloved Aunt Bee. Innkeeper Alma Venable began collecting the late actress’ items following her estate sale in 1990. 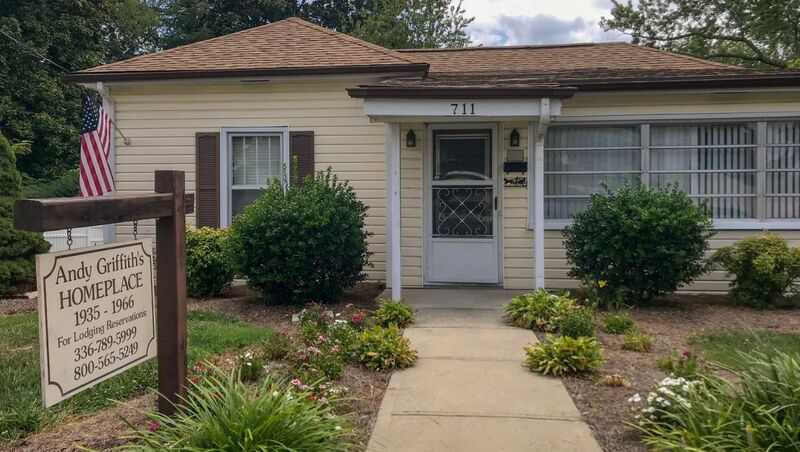 Andy Griffith’s childhood home is also nearby, called Andy’s Homeplace, a bed and breakfast owned and operated by the Hampton Inn of Mount Airy. Need a haircut? A visit to Floyd’s City Barber Shop could be in order. Russell Hiatt has shorn the locks of some famous past residents of Mayberry including George Lindsey, a.k.a. “Goober,” and has more than 20,000 photographs on his Wall of Fame. 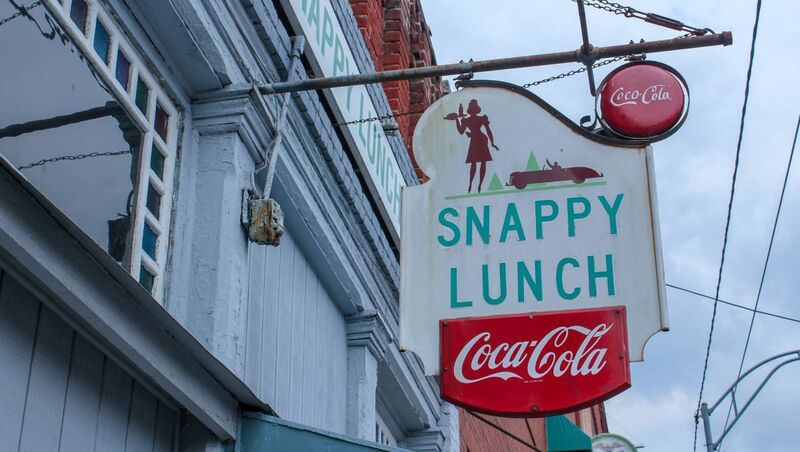 No Mayberry visit would be complete without a fried pork chop sandwich from the Snappy Lunch. Then-student Andy Griffith frequented this quaint diner for a quick lunch before local schools had cafeterias on campus. Originally an early 20th century elementary school, the Andy Griffith Playhouse was the site of Griffith’s own early thespian training. A TV Land bronze statue of Sheriff Taylor and Opie resides outside the playhouse. Those interested in learning even more about Griffith’s life can visit the Andy Griffith Museum, which features hundreds of items from the career of the actor, producer, singer and writer, all collected by his friend Emmett Forrest. A Mayberry-themed mural spanning three walls was completed in summer 2013 by Greensboro’s Chip Holton, artist in residence at O.Henry and Proximity hotels. Betty Lynn, the actress who played Barney Fife’s girlfriend, Thelma Lou, stops by the museum the third Friday of every month to sign autographs and chat with fans. Approach from any direction and see Pilot Mountain – or as fans of the show might know it, Mount Pilot – rising more than 1,400 feet above the rolling countryside of the region. Dedicated as a National Natural Landmark in 1976, this solitary peak is the centerpiece of Pilot Mountain State Park. 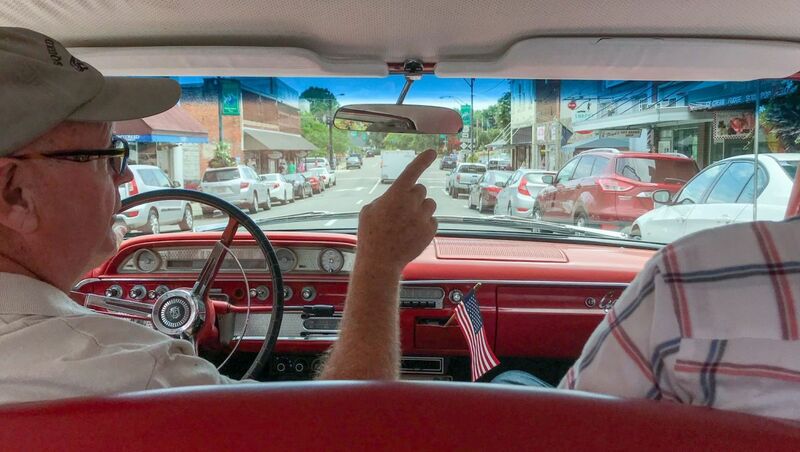 In addition to Mayberry-themed attractions open year round, thousands of fans visit Mount Airy each September for its Mayberry Days celebration. The 4 family festival, hosted by the Surry Arts Council, features a parade, golf tournament, Andy Griffith trivia contests, screenings of show episodes, special appearances by actors from the show, live entertainment and more.